How long will it take to get my server or parts? Please allow 1-3 days for configuration of your server plus up to 3 business days for ground shipping unless you choose an upgraded shipping method. When in stock, orders consisting of parts only will ship out same day if the order is received before 3pm CST. Can I request to have my server expedited? Yes, there will be an additional labor fee for this service and it will be subject to the type of server you are purchasing. Priority Overnight shipping is available. If you need to request an expedite, please contact us at 1-877-851-2260. Explain your warranty and how it works if I have a problem? Details of our warranty can be found here. If you can see it or touch it we support it. We kindly ask that you fill out a support ticket available in My Account if you are in need of a replacement component. And as always, please contact us at 877-851-2260 and ask for a Dell Certified Technician who can assist you in pre- and post-sales support needs. We are here to ensure that every server STI sells is tested and leaves and arrives in excellent condition. STI also offers several extended warranty and support options. Please contact an Account Executive for pricing on options that best suit your needs. We accept the major credit cards: AMEX, Visa, MasterCard, and Discover. We also accept wire transfer and ACH. Can I pay by credit card over the phone? Yes. Please contact the Customer Service Department or your Account Executive directly with your credit card information. Yes. Payment terms are considered for customers who have purchased frequently from Stallard, with expected annual minimum purchases, and where individual sales orders are greater than $10,000. Payment terms are typically net 10 days, but no longer than net 30 days. Do you offer large discounts for large orders? Yes, we do have some bulk pricing available. Please contact an Account Executive at 1-877-851-2260 for a personalized quote. We ship FedEx for most orders. UPS is available upon request. Depending on the size of the shipment, a trucking company may be used. Can I pick up my server if I live in the area? Absolutely! We can waive the shipping cost, but tax will be included unless you can provide a reseller's certificate. Yes we can ship all of our off lease equipment worldwide. Some Dell renewed equipment is restricted to the Americas. Please call if you are outside the US se we can get you an international shipping quote. The day after your order has been shipped, we will email you an invoice that includes tracking information. Customers who are not fully satisfied with our product are asked to fill out a support ticket available in My Account. After completing this form, a representative from our company will contact you in regards to any issues you are experiencing and walk you through the return process if necessary. Where do I find the drivers, updates, and downloads for my server or workstation? 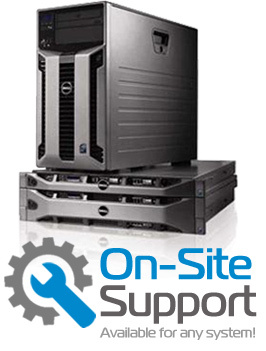 All information on Dell's systems can be located on their support site, www.support.dell.com. There you will find all the drivers, firmware updates, manuals, and general support for your Dell product. All drivers and support for non-Dell products can typically be found at that manufacturer's website. What's the difference between Dell Rapid and Versa rails? Rapid rails can be easily and quickly inserted into Dell racks without screws (these might not work in all racks). Versa rails work in most racks but require screws. Is there a speed advantage to 3 memory channels? In general, yes. If there is only 1 memory module per channel in 11 series servers, it will run at 1333mhz (memory being used must be 1333 mhz as well). Most 3 channel servers will have DDR3 vs DDR2 which makes them faster (see page 32 of Dell's R710 Manual for an example). All-in-all an 11th generation server running the Intel Xeon 5500 chipset will run faster than previous generation servers running Xeon 5000 series chipset. Does my RAID controller support Citrix and/or VMWare? Citrix and VMWare should be supported by any PERC4 or greater RAID cards. If a brand new card isn't supported, it's very likely that it will be provided in the future. VMWare may need to be updated to be compatible with new cards in an existing install. My server arrived today and I am getting no video. What is the problem? Occasionally during shipping, some internal server components can get rattled and become a little loose, preventing the server from booting properly. If you experience any problems, the first thing to try would be re-seating the CPU's, memory, and anything that could have become jarred loose. To re-seat the CPU's, first remove the heatsinks and clips, and then move the lever on the socket and pull the CPU straight up and then place it back in the socket and lock the socket lever back down. Then re-clamp the heatsinks down and try to fire it up again. What is the difference between PERC5, PERC6, H700? Virtually everything including the speed of data transfer/read/write, amount of cache, more supported RAID configuration, types of hard drive, and more. Certain servers only support certain cards. Dell provides a good matrix on how the PERC5 copmares to the PERC6 and a very detailed guide on the RAID cards supported in 11th generation PowerEdge servers too. How do I set up my containers and install an OS? You set up your hard drives from the PERC utility by pressing either ctrl-m or ctrl-a depending on manufacturer. Once in the utility use the menus to set up your drives however you wish, RAID 0 (striped), RAID 1 (mirrored), RAID 5, RAID 10 etc. Some controllers require a drive scrubbing process that can take hours while others are almost instant but require you to initialize the container, wiping the drives. Now you can run your OS CD and install any PERC drivers if necessary. Windows based OS's require you to press F6 right away and then load the driver when asked. Some won't require the driver, as with Windows Server 2003. When loading Windows I get the error "There are no hard drives installed on this system"
Your installation of Windows does not include the drivers for your controller card (RAID, SAS, SCSI, SATA). Download the correct drivers for your system from Dell's support site at http://support.dell.com. When booting up the installation CD you will see a prompt to press F6 to load your third-part drivers. My Windows install keeps failing with a blue screen, what is causing this? Check to ensure that 'demand based power' is disabled in BIOS. If this is disabled and you are still receiving this problem, try installing with one processor at a time. This will tell you which processor is giving you the error. If this still doesn't produce a successful install you most likely have a motherboard issue. Why does my system show that I only have 256MB of memory installed? Turn off 'OS Install mode' in your BIOS. When enabled this limits the amount of available memory to 256MB regardless of what is installed in your server. Why won't my system POST, is it DOA? Since all systems are tested and updated before leaving our facility, chances are the system components became loose during shipping. Open the system and reseat any removable components, CPU, RAM, VRM, add-on PCI cards, risers, etc... This should produce a successful boot. Why does the RAID battery show a failure during POST? Enter your RAID configuration utility in POST and reset the battery counter. Select 'objects' from your menu, then select 'battery', you will see an option to reset the battery counter.